BlueCross is proud to support the choices of thousands of older people across Melbourne, those who chose to stay in their own home and those who need support at one of our aged care residences. BlueCross has been a leading provider of aged care services since 1993. We have 23 aged care residences and care for over 1000 clients in their own homes. At BlueCross our mission is to provide the highest possible quality of life with the best health and wellbeing outcomes for each individual. Our person centred approach to care means our residents’ and clients’ age isn’t as important as what they can do and wish to do. Our quality care and individually tailored wellbeing and lifestyle programs mean that residents and clients can enjoy each day, the way they choose to. BlueCross staff ensure that we’re ‘with you’ at all times, listening, engaging and giving each person our undivided attention. We believe that attitude is a choice & we choose to work in a professional, accountable and fun filled environment. 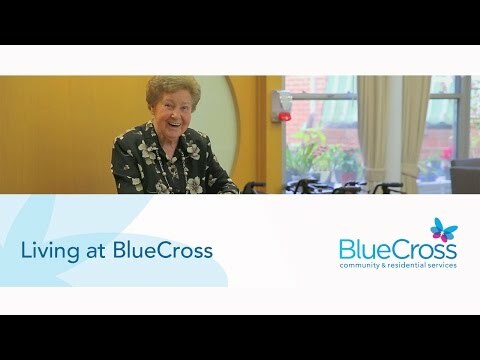 BlueCross staff are passionate about having fun at work, with each other and with our residents and clients. BlueCross staff strive to make someone’s day or moment. Through a small act of kindness or an unforgettable engagement, we can turn even routine encounters into special memories. We love answering your aged care questions, call 1300 133 414 to speak with one our experienced staff members, to help you decipher the aged care journey. We celebrate Thelma's 100th birthday! Queenie Stehn, resident of BlueCross Tarralla in Croydon, celebrated her 100th birthday with family and friends recently.